Dr. Alberto Espay is the director, professor and endowed chair of the UC James J. and Joan A. Gardner Family Center for Parkinson’s Disease and Movement Disorders. The following has been condensed and paraphrased from an interview with Prof. Alberto Espay on January 21st, 2019. It is based on a paper that Prof. Espay recently authored with Prof. Anthony E. Lang in the Journal of Parkinson’s, I recommend reading it first to better understand the topics discussed below. Could you elaborate on the concept you put forward that the way we typically understand the world around us, through cause and effect relationships, is flawed, and its implications for how we make sense of complex diseases like Parkinson’s disease (PD)? I would start by saying that we don’t have to make sense of the world for it to continue to operate. We break the world up into bits and pieces that we think are rational, if something is there it must be there for a reason that we can determine by examining the sequence of events that led to it. But, complex diseases such as PD may not fit this understanding because nature does not work in what we perceive as a logical sequence of causes and effects. This creates a lot of mistaken beliefs about the nature of complex diseases. For example, most people who research PD readily admit that it is likely many diseases, yet the same people if asked ‘how close are we to finding a biomarker that can predict PD progression’ would say ‘we are very close to finding it’. We happily live with this dissonance, but we can’t have it both ways. We have to remember that humans came up with the concept of ‘Parkinson’s disease’ along with narratives to describe what it is and what it isn’t. We don’t question this because the experts tell us that PD follows a logical sequence with a beginning and an end and any exceptions are just exceptions. Do you hold out any hope that we may stumble across a silver bullet, like levodopa, that is able to treat the vast majority of people with PD? There are two levels to this discussion, disease modification and symptomatic treatments. To do the latter you just need to target common denominators, which in PD are deficiencies in neurotransmitters like dopamine. Symptomatic treatments just replace what is missing, they do not affect the underlying biological drivers of disease. Another common denominator is protein aggregation. Discoveries surrounding protein aggregates fed into the narratives we have about PD because everything that we have deemed to be important has come from convergent findings. We see Lewy bodies in the brains of most people with PD and assume that must be telling us something important about the disease. This also applies to the genetic discoveries around alpha-synuclein where we found that individuals that over produce alpha-synuclein got PD, so we say to ourselves that these discoveries must be telling us something important about the cause of this disease for everyone with the same diagnosis. But this is just a feature of individuals with those specific mutations and we should not extrapolate beyond them. How can we start to incorporate enough complexity in our models of disease to make them more applicable to developing disease modifying therapies? Almost all of our models just model the symptoms of the disease, which makes it very difficult to test therapies that might be targeting the mechanisms underlying the disease in humans. Using these models we have so far developed eighteen disease modifying drugs that have made it to phase three clinical trial, all of them failed, we are 0 for 18. It is an un-achievable goal to try to create a model that replicates Parkinson’s disease because there is no such thing as Parkinson’s disease, it is a fiction. If we continue to think there might be a magic bullet that comes along and will work for everybody, this will hamper our ability to successfully treat the actual biological disease for each individual with PD. Any advice for how patients should apply this new understanding of the disease to themselves? It is important for patients, caregivers and society in general to question any claim that a cure is in sight. We need to be hopeful but we also need to be realistic so we can shift from continuing to invest billions of dollars in a model of research that is not going to get us anywhere. Patients should question their doctors or anyone else that tells them a cure is coming. The other concept patients should keep in mind is that there is no script to PD. Most cases follow a unique path. We have this idea of stages of the disease, but they are misleading. We can’t say things like ‘there are 5 stages of this disease and you are at stage 2’. There are layers of complexity that go into understanding PD for each individual with this disease that this staging system ignores. Most researchers say that we need to go back to the basic biology and develop a better understanding of the underlying disease. 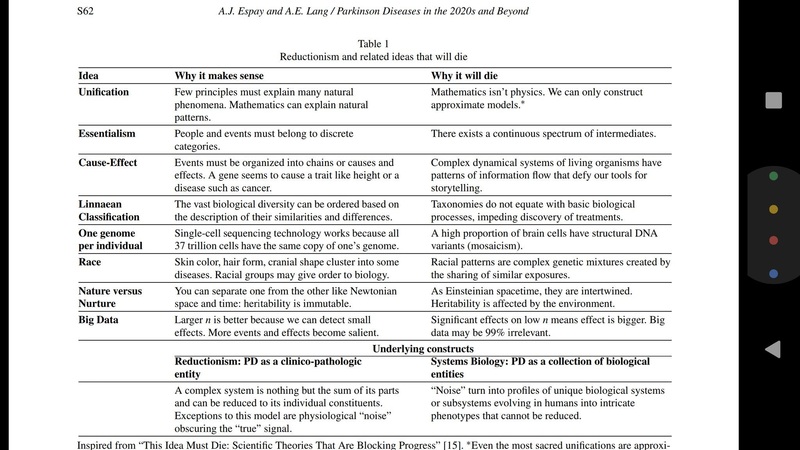 But there are two competing ideologies for how to do this, reductionism and systems biology. Which approach do you think we should be funding? We cannot be reductionists anymore. Reductionism is the idea that the whole is nothing but the sum of its parts. If I find a family with a given mutation that consistently gets PD and I work out what that mutation does, reductionism will say that we have uncovered a novel target for therapeutic development in PD, implying that this mutation is a piece of the puzzle and it is telling us something about everyone with PD. All that has been uncovered is a therapeutic target for that family. This belief has driven our attempts to understand this disease for 200 years. We think we honor the giants in the history of neurology by trying to prove them right both clinically and biologically, this is arrogance and folly. Systems biology is different; it is a move from convergence to divergence. In it we no longer try to match clinical features to biological mechanisms. That is clinical-pathologic convergence. Systems biology looks at divergence by trying to collect as many of the biomarkers and signals of the disease as possible, identify the outlying biological signatures, and only then determining which patients those signals belong to. This is what other fields of medicine have done, neurology is the last bastion of medicine that refuses to accept this. What can be done to accelerate the adoption of a systems biology approach to PD? The “shortcut” solution will come from the genetic forms of PD that will allow us to identify and target just these subsets. Within the next 5 years we should have a therapy for GBA patients, though this too may lead to pitfalls because if it does succeed we may then try to give it to everyone with PD based on the belief that this mutation is telling us something about everyone’s disease. The longer path that we also need to take is to study aging as inclusively as possible. In the past we took groups with tremor and without tremor, or with dementia and without dementia, and tried to identify biomarkers that can tell us what is different between the two groups. This assumes that the biology matches the neat clinical criteria that we have defined. Instead we should look agnostically at the biology so we can identify groups with common underlying mechanisms, regardless of what symptoms those mechanisms lead to. We might then also be able to match them to existing therapies that target those mechanisms. We hypothesize that we will find that many past therapies that failed actually did have therapeutic value but only for a small group of patients. Before the 2020’s are over, we hope that we will be able to match at least the first right group of patients to some of the therapies we discarded in the past. For more on these topics click here to read the original paper referred to in the text above. I understand the theory behind this condition but why isn’t more research done?